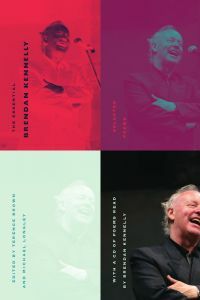 In their foreword to the Press’s fall publication of The Essential Brendan Kennelly, Terrence Brown and Michael Longley write that “Kennelly’s poetry is instinctively sociable, hospitable as it is the lives, voices, deeds and defining deaths of a host of characters.” Textually, this quality of Kennelly’s work leaps off the page through Kennelly’s written shifts in vernacular and his regular use of ‘quoted’ speech. This weekend, I had the chance to listen to the audio CD included with the book and found that, orally, these various voices are brought to life in a different manner than one might expect. Through works such as “The Dinner,” Cromwell, and The Man Made of Rain, Kennelly makes it clear that he is not one to shy away from assuming a persona as he reads. As I expected from Brown and Longley’s foreword, Kennelly is extremely talented in conveying voices other than his own in a short amount of time as he is able to switch from the likes of James Joyce to Oliver Cromwell with ease. However, after listening to this particular collection as a whole, I was pleasantly surprised to hear how many of these readings are voiced simply and earnestly through Kennelly as himself, without vocal allusions to distinct personae. Through a certain steadiness of tone, Kennelly embodies a voice that is not overly caricaturized, but rather, one whose calm variances in tenor allude to the characteristics of others by continually returning our attention to the poem’s form and subject matter. Kennelly’s ability to briefly possess multiple identities while remaining all within his own voice is particularly noticeable in the poem “A Giving.” In the poem, an unidentified speaker attempts to pass on “the mystery of giving” that he receives from a “reticent god.” In the process, he seems to take on the characteristics of this “giver of images” himself. Kennelly opens the poem slowly as the speaker explains the task at hand. However, as soon as the speaker begins to describe this giver and the bounty of experiences it provides, Kennelly picks up the pace in his own reading. Through Kennelly’s change in tempo, one can literally begin to hear the traits of the giver come alive. The giver’s embarrassment “in the prospect of possession” is made apparent verbally as Kennelly lists and purges these images more quickly than our initial speaker might have done. However, the original voice of this speaker is not totally lost. Instead, his humble awe of these gifts is made noticeable through Kennelly’s pauses especially in the lines “I listen to the sound of doors” and “They are like the heartbeats of this creator.” Just as Kennelly states at the beginning of the reading, it seems as though “poetry is in the end a connection and a giving[,]” one which we are able to receive not only through his gift with words, but through his gift with voice as well.